Time to sell your Beachview condo? Read about today's resort-market condo buyer. 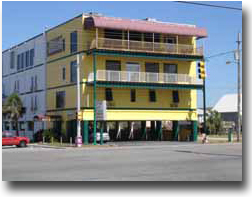 Beachview condominium is located across the street from the Gulf Shores Hangout / Gulf Place, Pink Pony Lounge, and the Gulf Shores public beach. Beachview consists of 50 condos built in 1995 and most are small efficiency units. The condominium's prime location is one of its best attributes. Looking for comprehensive info for condos for sale in Gulf Shores, AL? We've published info for each building along with helpful sales info including a recently SOLD Quick Search with each condo on the Alabama Gulf Coast listed alphabetically to make finding anything quick and easy. Each address on a condo's individual sales page is linked to Google maps to make finding directions easy and the maps have a labeled roads option and a satellite view. We've included all revenues for condos in Gulf Shores and also for condos for sale in Orange Beach, AL. We've included exclusive aerial imagery and links to separate condos with price, waterfront types and other criteria. Basically, we've published as much info as legally possible to make researching real estate from the comfort of home a real option. To find investment info, such as an example cash flow statement, look no further than CondoInvestment.com. Please let us know if you would like further info for Beachview or any other condos, homes or real estate along the Gulf Coast or would like to schedule a private viewing by emailing info@condoinvestment.com or by calling (251) Area-Pro (251-273-2776) for immediate assistance.